In a small bowl, add garlic powder, ground cumin, salt, 1/2 teaspoon smoked paprika, and black pepper. Mix the spices together. Set aside. 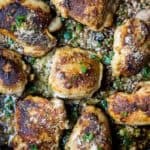 Sprinkle chicken thighs with the prepared spice blend mixture. Gently rub the mixture into the thighs. Saute on the first side for 5-6 minutes. Flip the chicken, turn the heat down to medium and cook the chicken for 8-10 minutes. Until you don’t see any pink. Remove the chicken from the pan and set on a plate. Turn the heat down to low. To the skillet add butter, 2 tablespoons of olive oil, and minced garlic. Using a spoon or a whisk, scrape all the goodies (the brown bits) off the bottom of the pan. Stir until garlic is fragrant and butter is melted. Add in parmesan cheese, smoked paprika, and red pepper flakes. Whisk to stir everything together. Place the chicken back in the skillet and let cook for 1-2 minutes. Remove from heat. Using a spoon, pour some of that delicious sauce over each chicken thigh. Garnish with 1 tablespoon of parmesan cheese and chopped chives.